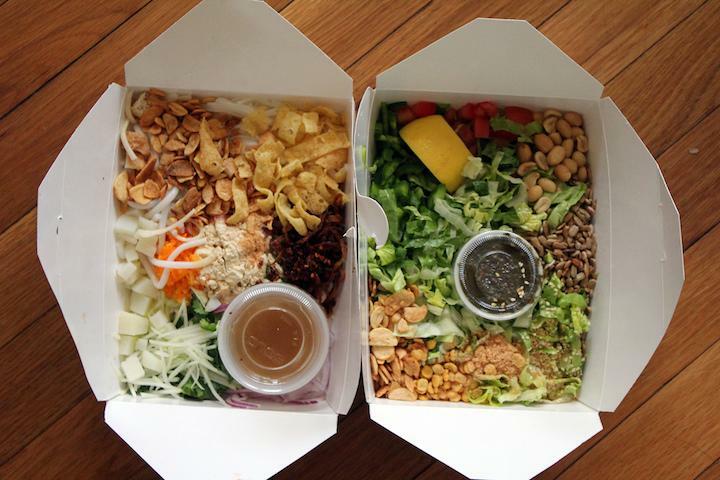 Who is Winning the Food Delivery War? There are more options to get food—as in the kind you eat at home rather than at a restaurant—than ever before. Sure, there are traditional brick-and-mortar stores, like Costco and Trader Joe’s. But in the last decade there’s been a boom in food services that can be managed through a digital app. Depending on where you live in the country, you can get groceries delivered through platforms like Instacart or Amazon Fresh. You can order all the ingredients you need to cook a meal with meal kit services like Blue Apron. Or, you can feast on ready-made meals from the likes of Thistle and Munchery. You might even get your favorite General’s Chicken delivered on Seamless or GrubHub a few times a week. In this stacked market, which services do people favor? We analyzed data from Priceonomics customer Earnest, a loan provider, looked at anonymized data from tens of thousands of loan applicants to answer a number of questions about this space: How does spending vary by service? Across sectors, are they any real differences between customers? And which companies, in particular, dominate each space? 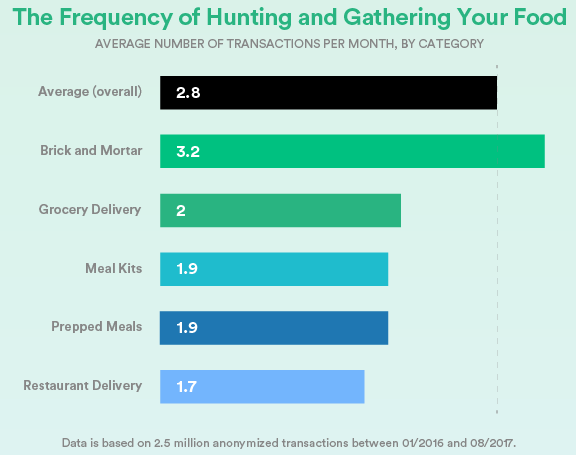 We analyzed 2.5 million transactions between January 2016 and August 2017, categorizing by types of services that generally reflect how people consume food at home, rather than eating outside the home in an establishment. The data does not include restaurant transactions. It should be noted that our data, drawn from loan applicants may reflect a younger demographic than the national average. The average age in our data set is 32. We found that 90% of the overall “eating in” food spend is still at a traditional grocery store. 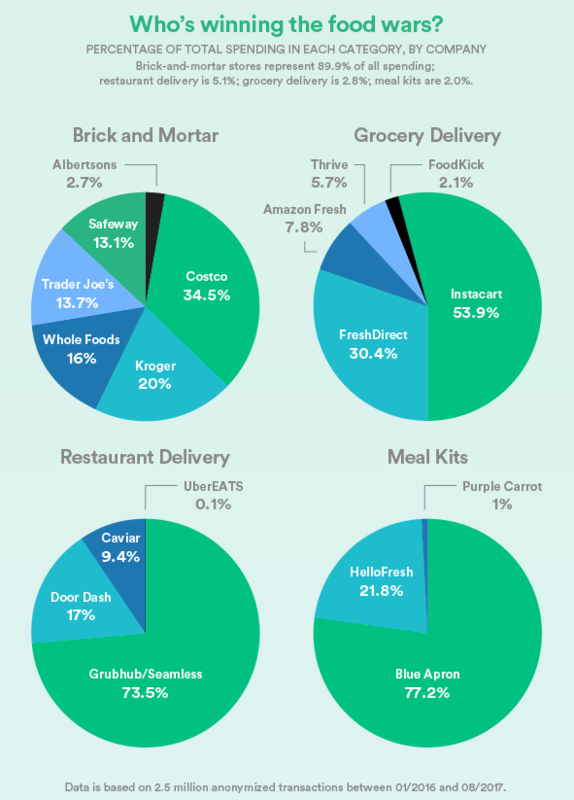 Among grocery delivery, the overwhelming market leader among startups is Instacart. For meal prep, the clear market leader is Blue Apron. Men are marginally more likely to visit a grocery store while women are more likely to use grocery delivery and meal-prep services. People in New York, California, and Washington, D.C. order food delivery at rates up to 328% higher than average and a combined AmazonFresh+Whole Foods are poised to make up 14.6% of spending among this demographic, mostly through Whole Foods. In our analysis, we focused specifically on five food sectors: brick-and-mortar outlets (physical grocery stores), grocery delivery, restaurant delivery, meal kit services, and prepped meals. Brick-and-mortar includes Publix, Whole Foods, Kroger, Safeway, Trader Joe’s, Costco, and Albertsons. Grocery delivery includes Instacart, Fresh Direct, Foodkick, Amazon Fresh, and Thrive. Meal Kit services include Blue Apron, Hello Fresh, and Purple Carrot. Prepped meals include Freshly, Thistle, and Munchery. Restaurant delivery services include UberEATS, Doordash, Seamless, GrubHub, and Caviar. When we break these categories down by a percentage of total spending—about $120 million over a 20-month period—it’s clear that brick-and-mortar grocery stores dominate with 90% of market share despite industry fears that they are being replaced by alternatives. Distantly behind, though still with significant market share, is restaurant delivery with 5.1% of overall sales, followed by grocery delivery (2.8%), meal kits (2%), and prepped meals (0.2%). On an individual level, customers spend considerably more at brick-and-mortar stores than on other services. 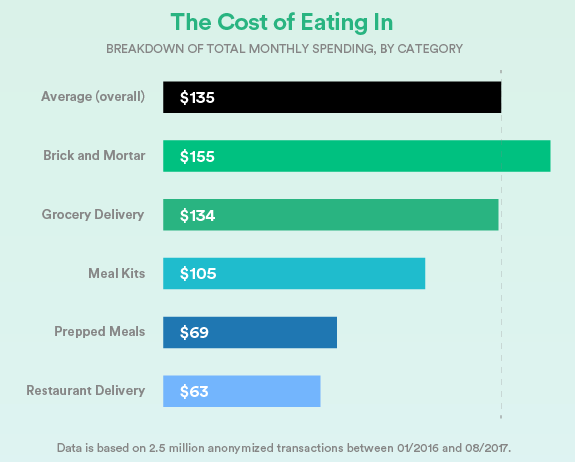 At $155 per month, the average customer spends $21 more at physical grocery stores than on grocery delivery, and more than double what they do on restaurant delivery. On average, customers go to physical grocery stores 3.2 times per month—vastly more than they use delivery (2 times per month), or meal prep services (<2 times per month). That means on a per transaction basis, people spend just over $50 per visit at a grocery store while they spend just more than $30 per restaurant delivery. That said, some regions are more apt to ordering delivery than others. Country-wide, the percentage of total food purchases that are delivery (restaurant + grocery) is 12.6%. But it seems coastal residents order delivery far more than average. 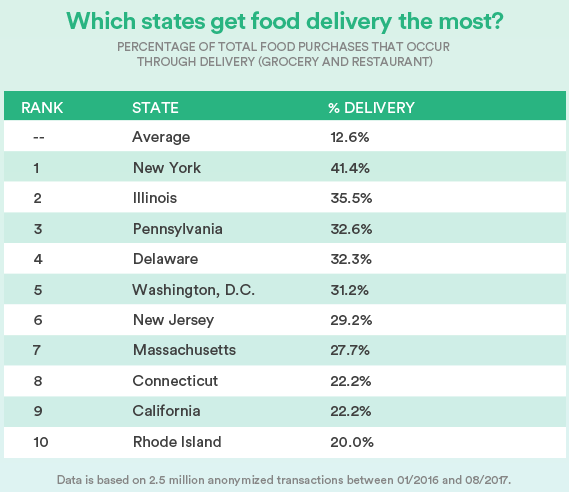 In New York, 41.4% of all food purchases are delivery; in DC, 31.2%; and in California, 22.2%. The rest of the list is populated mainly by states bordering the oceans (Delaware, New Jersey, Massachusetts, Connecticut, Rhode Island). Next, let’s turn to the individual companies that make up these categories. Are there certain services or establishments that lead the pack? Here’s how each category breaks down. Representing 34.5% of all brick and mortar food transactions we analyzed, Costco is the most popular physical grocery chain. Kroger (20%), Whole Foods (16%), Trader Joe’s (13.7%), and Safeway (13.1%) all have relatively similar shares, and Publix (not pictured) represented less than 0.1%. (Note: We should qualify that the brick and mortar stores here reflect the geographic locations of our loan applicants). In each of the other spaces, one company seems to commandeer the vast majority of sales. 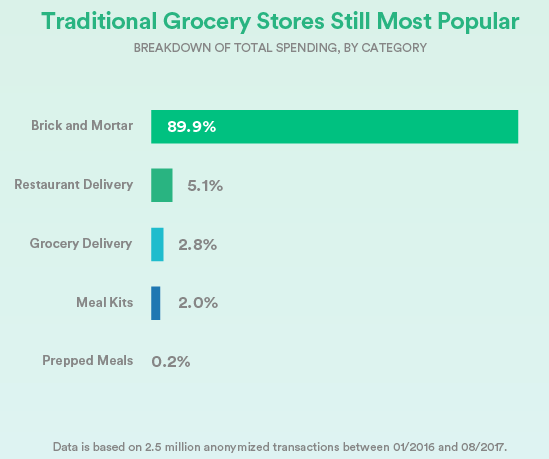 With grocery delivery, Instacart (53.9%) is heads and shoulders above the competition (Amazon Fresh, at 7.8%, is still far behind, but sure to grow in the coming years); restaurant delivery is dominated by the Grubhub/Seamless powerhouse; and Blue Apron has a stronghold on the meal kit space, with 77.2% of all purchases. Lastly, we looked at how men and women shop. 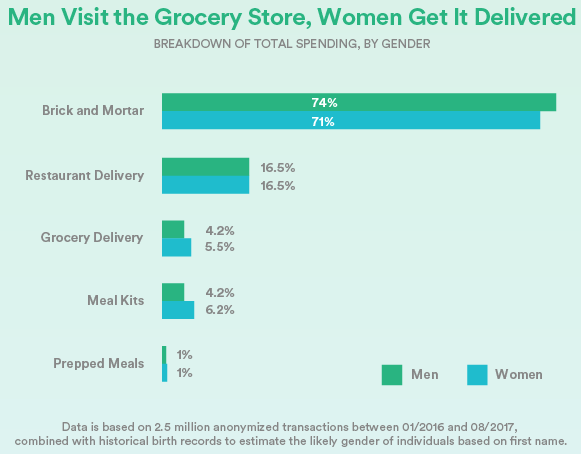 According to this analysis, men go to brick-and-mortar grocery stores marginally more often than women and women use delivery and meal kit services more than men, The data underscores other reports showing that increasingly grocery stores are appealing to male shoppers. 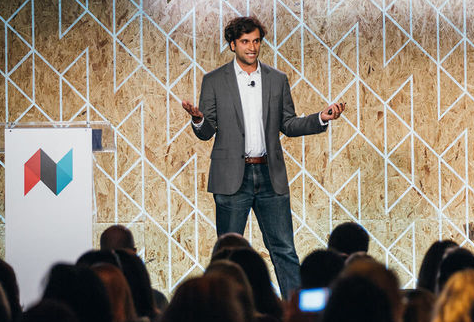 With new tech emerging in the food space—complete with checkout line-free stores, drones, and artificial intelligence-driven delivery methods—there’s been a lot of talk about the “death” of the traditional grocery store. While delivery companies (and food tech in general) are rapidly growing, our data suggest that these fears may be a bit premature. This year has also witnessed headline-worthy events about the food business, including Blue Apron’s IPO and the acquisition of Whole Foods by Amazon. According to this data, the total slice that Amazon will now control—between Whole Foods and Amazon Fresh—is about 14.6% of total food spending. While that’s a hearty piece of the pie, Amazon will still have to battle incumbents like Costco and delivery service Instacart to be the market leader. Brick-and-mortar grocery stores still control a vast share of the overall food purchasing space, and customers both spend more money there and go to stores more frequently than they use delivery or meal kit services. 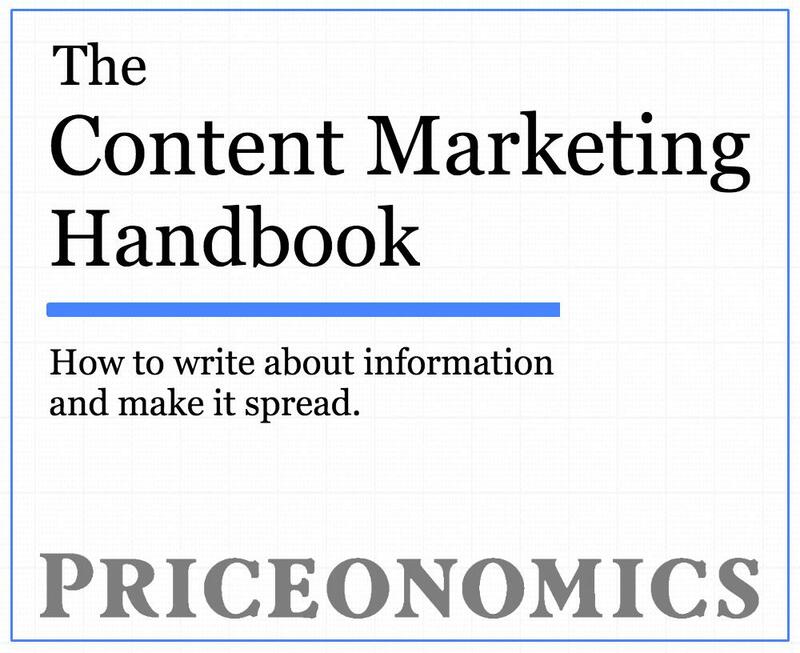 Note: If you’re a company that wants to work with Priceonomics to turn your data into great stories, learn more about the Priceonomics Data Studio. Cover photo by Flicker user Quinn Dombrowski.